The 3D printed model of Wheelie© is a valuable learning tool that enables a child with vision impairment to get tactually familiar with Wheelie©, one of the main characters in the Ballyland game apps. You can even drive Wheelie around, making his wheels turn! 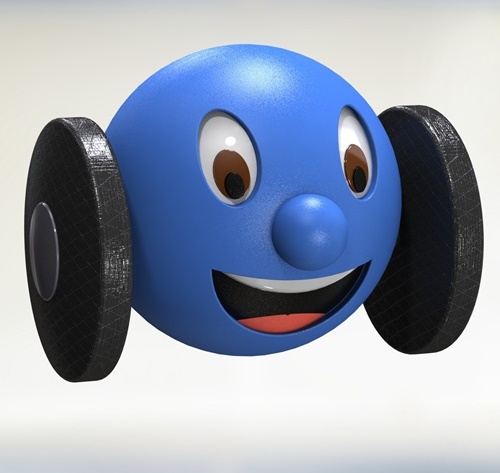 Download the licensed file package to 3D print one 3D model of Wheelie©. The download consists of four stl files; the body (1), 2x wheel (2) and left hand cheek (3) and right hand cheek (4). All copyright of the 3D print model of Wheelie© remains with Sonokids®. By downloading the .stl print files of Wheelie, you confirm that you have read the disclaimer and that you agree to the conditions as set out above. If you want you can hand paint some of Wheelie's features. Use child safe paint. You can also choose to leave the model unpainted! Its tactile features will still be as recognizable and valuable as ever.